Lissara Presbyterian Church and Church Hall were both packed to capacity on Thursday night for the Installation of the Rev. Samuel Armstrong. The service was conducted by the Rev. James Lamont, Moderator of the Down Presbytery and the Scripture lesson and the sermon was given by Rev. JA Ball. The Rev. W Kerr, Clerk of Presbytery, issued the statements of the standards of the Church including the Rule of Faith, while the charge to the Minister was given by Rev. JC Pedlow. During the offering, which raised £339 for the Students’ Bursary Fund, the choir sang the anthem, “Son of my Soul” with Mr H Hardinge at the organ. After the installation, the ladies of the congregation served supper to everyone present. The Rev. J Lamont, in welcoming the Rev. S Armstrong and the family to Lissara and Down Presbytery, thanked the congregation for their help and co-operation during the vacancy. Mr Armstrong, who received a standing ovation, thanked all who had contributed to the success of the evening’s proceedings and looked forward to a successful ministry in Lissara. The Rev SEM Brown, Minister at Abbey Church, Monkstown, where the Rev. Armstrong have been Assistant, and the Rev. 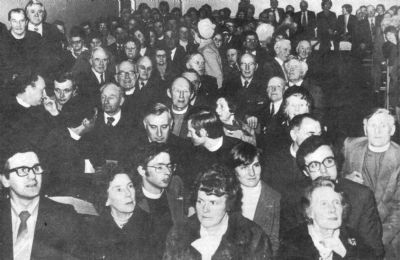 Cunningham of Antrim, spoke in glowing terms of the sterling qualities of Mr Armstrong as a preacher and his popularity with people, which was evident in the large number who attended from Monkstown. Mr S Clements, on behalf of the congregation, presented Mr Lamont with a brief-case as a token of all he had done during the past eight months of vacancy.